With the holidays approaching, there is sure to be no shortage of sweets. I try not to be a Grinch, but I also try to not offer too many sugary treats over the holiday season (its a delicate balance). I also try SO HARD to squeeze in fruits and veggies during this busy time. Today, we whipped up some cupcakes. Instead of using heavy frosting, we chose to make a simple raspberry sauce to drizzle on top. These are not as sweet as traditional cupcakes, but are also not as high in sugar and junk. Making mini-cupcakes instead of the full-sized ones also helps keep portions under control. Mix the cupcake mix according to the instructions on the box, replacing any butter with olive oil (not being lazy by not providing steps…each brand has different ingredients!). Mix flax seeds, almond extract and crushed almonds into the mix. Bake the cupcakes according to the box instructions. Put all ingredients in a saucepan, boil, and then simmer for 15 minutes, stirring occasionally and breaking raspberries apart with the spoon. Turn off heat and let cool. 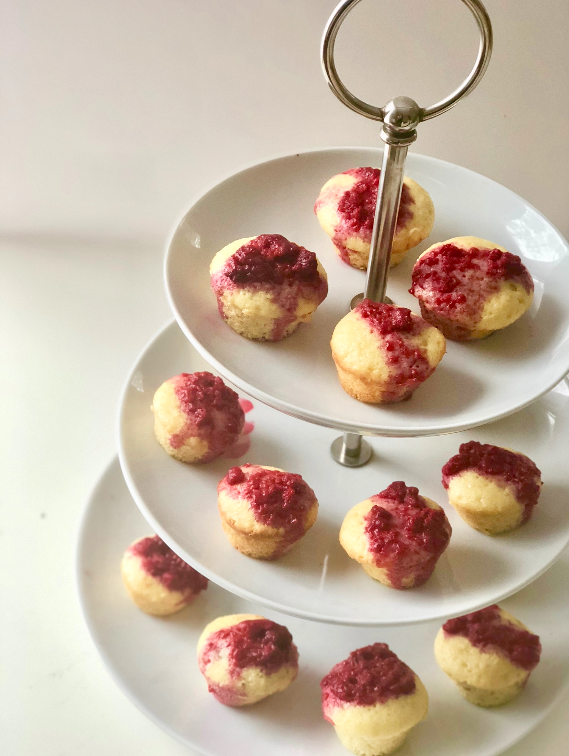 Top each cupcake with 1/2 Tbsp raspberry sauce (or more according to preference).